Perfect Ponte Vecchio Location! Terrace-AC-Free WiFi-Historic Location-5 Stars! This is a charming small house in an excellent Florence historic location, just two blocks from the landmark Ponte Vecchio. 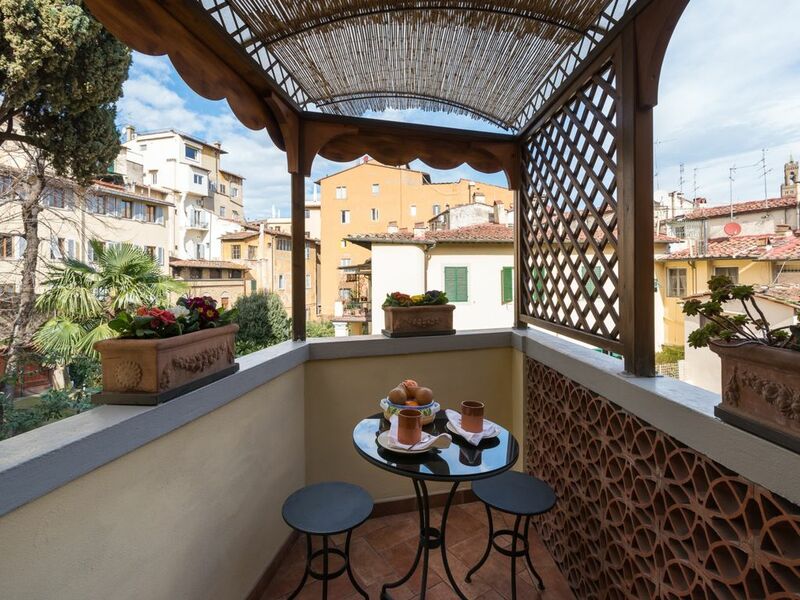 You will enjoy the feeling of living in a home with a terrace, right in the center of Florence! It is tastefully decorated with an up-to-date kitchen and bathroom. Cross the Ponte Vecchio going towards the Pitti Palace, take a quick left up a little street, and you're home in two minutes after morning of sightseeing, an afternoon of shopping, or a long lunch. Just on the other side of the river is the famed Uffizi Gallery, only an five minute walk from the house. One of the most surprising aspects is that this is truly an independent house, on its very own little piazza, the tiny 'Piazza de' Bonsi ' and was built in 1890 by the longtime Florentine Bonsi della Ruota family. The spacious living room has a beautiful antique painted Venetian china cupboard, lovely Tuscan dining table and chairs, and a comfortable sofa that includes a pop-up trundle bed that can be made up into two twin beds or a king-size bed. Enjoy breakfast in the kitchen if you prefer at the little counter that overlooks onto the private garden of the lovely villa next door. Off the kitchen is a small laundry room with washing machine. The bedroom is upstairs with a king-size bed and beautiful Tuscan armoire and dresser. Off the upstairs landing is the private terrace where you can take your morning espresso or sip a glass of Chianti as the sun sets over this dazzling city. The bathroom is nicely appointed, clean white tile and marble, enclosed shower, bidet, good water pressure, lots of storage and halogen lighting. Casetta Bonsi della Ruota is conveniently located, you can walk to all the major attractions. See what the experts say about us! Conde Nast Traveler Magazine Italy Experience Maker award, Travel & Leisure Magazine Italy All-Star award! This property is offered by Italy Perfect. We are a family business with a mission! We want you to love Italy as much as we do. We can answer your questions in English or Italian. The confirmation materials you will receive from us include restaurant recommendations, tour guide, drivers, shopping tips, loads of helpful information! Please see our detailed description for more location information. The location near the Ponte Vecchio is very convenient, walkable to the sites. Located in the heart of Florence, near the famous Ponte Vecchio bridge. Small terrace with bistro table & two chairs. Very lovely, well appointed home located on a quite picturesque side street. The owners, Maurizio and Gabrielle, provided a warm welcome upon our arrival. Maurizio gave us a complete understanding of all the features of the home as well as providing detailed info on local shops, restaurants and points of interest. He was also very helpful in arranging transportation to and from the train station. The house itself is well appointed and provides all the comforts of home. It is also just minutes away from the Ponte Vecchio and other historical sites. When we return to Florence there will be one place we will want to stay and that will be Maurizio’s home. Charming, perfectly equipped, very comfortable, and - amazing location. Couldn’t have had a better stay. This was the perfect spot for our visit to Florence with our 20-something son. My husband and I enjoyed the privacy of the upstairs master bedroom and our son found the pull-out couch in the living room worked just fine for him. Every little touch is thought of in this small house. The kitchen was fully equipped with a dishwasher too. Maurizio met us when we arrived and gave us a very full orientation to the place. He also thoughtfully arranged a cab for us, the day we left. There were many personal touches -- we arrived to find a bowl of fresh fruit, a bottle of wine and Italian cookies to welcome us. This little place is a short walk from everything that we wanted to see in Florence and has a grocery store and various restaurants just 5 minutes away. Maurizio left us a very helpful list of good reasonably-priced restaurants in the area, which we used. We would happily stay here again! We spent a week in a wonderful, historic house, only a few meters away from the center of Florence with all its marvels, close to the river and to the ponte vecchio. A good super market is round the corner. Our contact with the agency and with the house owner was easy and absolutely friendly. If you stay in Florence in winter, you will have to pay a bit for the heating, because this comes apart. And ask about the wifi, if you need it. When we were there it was not really reliable, but the owner promised to check. We would certainly book the house again. The house was everything that we expected from the pictures. It felt like home during our 5 day stay. Maurizio made everything great from making recommendations for meals and visits to helping us book the taxi to the train station at the end of our stay. The attention to details in decorating the house, communicating before the visit, and greeting his guests were the best we have ever experienced in our years of traveling. Additionally the location is perfect, close to the bustle of Firenze but a cozy getaway during the hot summer afternoons. The house is perfect if one has no problems walking up steep cobblestone streets. It can be a hike at times but worth it. It was the perfect place to stay in Florence. Spacious and comfortable apartment in the heart of Florence. Minutes walk to major attractions and extremely convenient. The hosts were super gracious and were very hospitable. Would definitely stay there again and would highly recommend it to anyone travelling to Florence. Tuscan Jewel in Heart of Florence: The Ponte Vecchio, Uffizi Gallery, Pitti Palace Boboli Gardens are nearby. Walk Everywhere! The price includes linens, 1 set of towels/person, personal welcome during standard hours and free WiFi. Complimentary change of sheets & towels after every 7 days. Not included is the final cleaning €60, Florence hospitality tax paid in cash at check in, and utilities paid in cash at check out.